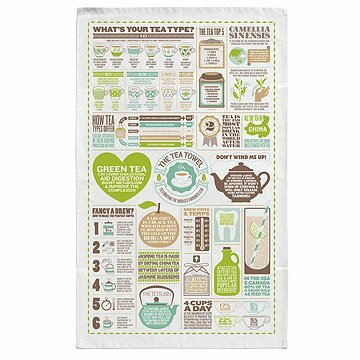 Learn a bit about your favorite brew with this charming info-graphic tea towel. Did you know that tea is the second most popular drink in the world, next to water? Or that jasmine tea gets its aromatic appeal by drying China leaves between layers of jasmine blossoms? Learn this and other well-steeped knowledge with this charming tea towel. Made in the UK of crisp premium cotton, this accessory showcases a vibrant infographic with information on tea types, history, and more. Made in the UK. Stuart Gardiner truly found his stride when he became an independent graphic designer. After years of pleasing clients in the music industry, going solo has "been a very liberating experience," he says. "Now I get to design my own products just as I want them." It's a benefit for all of us. The London-based artist, who studied graphic information design, injects his unique sense of humor into his towels-slash-conversation pieces, offering an elucidative take on beloved foods and beverages. "I design visually as I think, working with color, type, image, and form until I'm happy with the final design—or tired of looking at it, and need to move on," he jokes. Machine wash with cold water; do not bleach. Tumble dry on cool setting. Great to display and great for drying your tea cup! i got this for my mom for xmas because she loves tea and dish towels (haha). the quality is great and she loves the pattern. i might have to get one for myself! I wanted to get my boyfriend something tea related and this ended up being perfect! The quality is great and it's a super unique gift that I'm positive he doesn't already own. I definitely recommend this to anyone who loves tea or is giving a present to someone who loves tea. I found this just browsing, and it adds the perfect touch to the gift basket of teas and biscuits I am putting together for a gift. It has a lot of interesting tea "facts" screen printed on it that I am sure will be fun for the gift recipients! Cute and unique. Tea towels are very popular now but finding unique ones is the key! It was a gift she loved it and it's fun to read! She loved it and the nuggets of information of the different kinds of tea and how to brew.